Put your hand on your heart and tell me do you have a dental phobia or dread the drill ? I totally understand your fear as I was in the same boat until first time ever I sat in one of those reclining dentist chair first time ever 25 years ago, which means I never visited any dental surgery until I settled in the UK. Instead of a big bill, dentist gave me surprise, she took a maximum of five minutes to check my teeth and told me to go home, She said "Everything is fine , no need to worry and carry on whatever you are doing, we will see you in six months" and since then up to now I've been visiting the same dentist every six months, I am always out of the dentist surgery in less than five minutes. Same situation with my kids, sometimes we laugh and say to our family dentist that we have come to say a quick hello to you! Sweets, candies or lollies, I never introduced to my kids, and we are not missing it, neither me or my kids even know how many sweets or candy varieties out there in the market, maybe we have heard but not tasted. In fact white chocolate buttons were given to my daughter by a family member, nonetheless only we all 'surrender' ourselves when we hear the word 'Turkish Delight' - A Narnia Treat ! It is dull, Son of Adam, to drink without eating," said the Queen presently. "What would you like best to eat ?" "Turkish Delight, please, your Majesty." said Edmund. Excerpt - The Lion, Witch and the Wardrobe. Let's see what our Daughter had to say !! "My parents gifted me the first Narnia book when I was 9 and I hurriedly read through it so that I could move onto the next book. In no time, I had finished the series and would then run to find my mum or dad to retell them the whole story! I was elated when I found out that they were making a movie and I had my tickets booked well early so that I could watch it. My love for the world of Narnia has not yet diminished. I still watch the films and read the books with the same wonderment as before, 11 years on. One scene that stuck with me as a child was when the White Witch gives Edmund the Turkish delight to eat. To this day, if Turkish delight is ever mentioned in the house, someone will remember that scene! One time, I was watching a DVD of the Lion, the Witch and the Wardrobe and the Turkish delight scene came on. My dad snuck into the kitchen and produced a box of Turkish delights!! I had no idea they'd been hidden in the house for sometime (fair enough, as I probably would have eaten the whole lot straight away). There was some comfort in eating the Turkish delight and watching the film covered in a blanket!" So now we have set a new tradition, almost a ritual that once a year whole family get together and watch the Narnia movie trilogy during Christmas holiday and along with other snacks we would demolish a box of Turkish Delight ! It was one of my ultimate dream to make Turkish Delight at home, don't ask me how many kilos of sugar and corn flour I have wasted to prepare perfect Turkish Delight. Whenever I would get hold of a new recipe, I would try hoping that it will work but all my efforts went in vain even though I followed the exact recipe, even bought a candy thermometer ..I almost gave up !! But few weeks ago once again I saw this recipe . I had an itch to to prepare Turkish Delight. 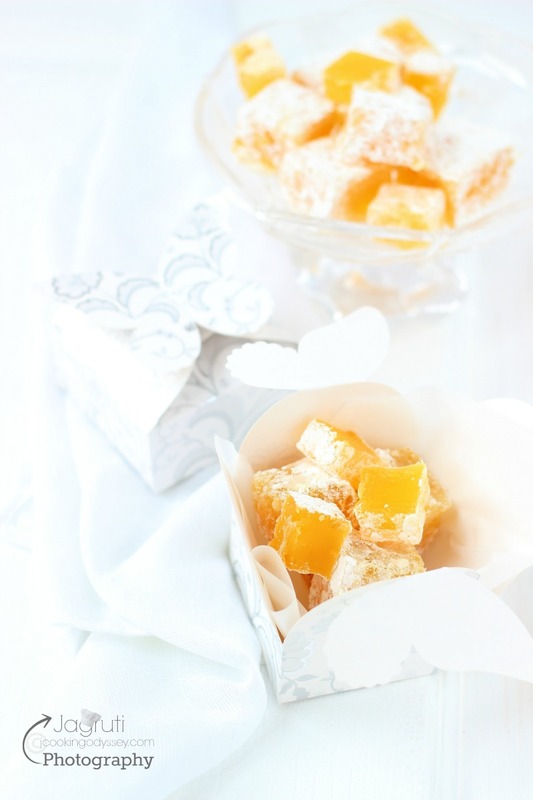 I was intrigued because the entire recipe was done in M/W and I was sceptical because I knew in the past how I failed to make soft and chewy Turkish Delight. 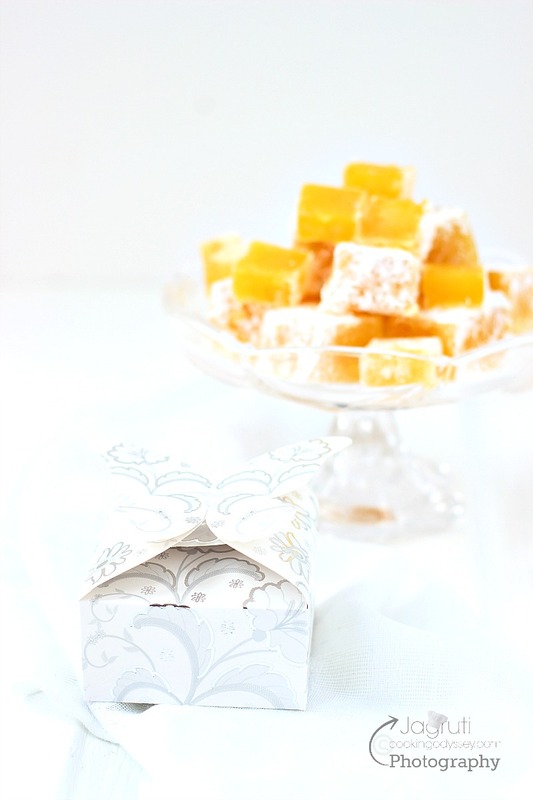 And I was so pleased and surprised everything went according to plan, and I had these little scented and exotic cubes Lokum or Turkish Delight, undeniably delicious ! So this time we demolished these gorgeous cubes while watching Narnia movie but I sneaked in the kitchen and surprised family with their favourite confectionery which they were longing for. 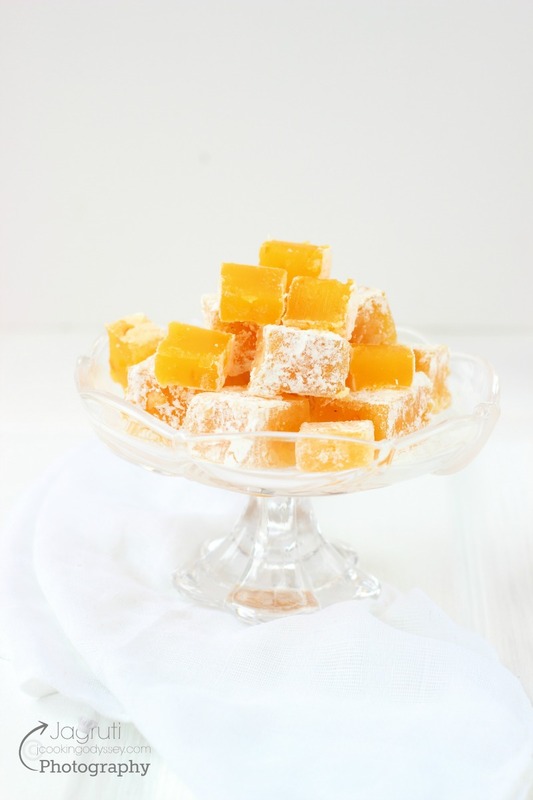 Orange and Cinnamon Turkish Delight, exotic and gorgeous, it's amongst the humble confection but so popular and made just from cornflour and sugar. Great for sharing or gifting wrapped up in a gift box, perfect for a valentines gift ! I followed the recipe's method exactly but in Ingredients I added mixed citrus peel. BTW, while I am drafting this post, just received a text from the dentist surgery, my six months routine dental check-up is due..let's hope even this time I do come out in five minutes too :) Oh yes, although I prepared these Turkish delight in M/W , still I am longing for to make on stove ,the traditional way and many other flavours are dancing in my head like Kesar-Pista-Elychi, Rose-Pista and Lemon !!!! Take water in a microwave proof bowl and add corn flour to it. Mix well until dissolves. Put the bowl in a microwave and heat the mixture for 2 minutes. Whisk smooth and return the bowl once again in the M/W and heat for another 3 minutes. Whisk again , mixture should be opaque in colour, if not heat the mixture once again for couple of minutes. then whisk again, try to keep mixture smooth as possible. Now add sugar and corn syrup. and heat the mixture for 5 minutes. Remove bowl, be careful bowl will be so hot, and whisk till smooth. Return the bowl to M/W, heat it for 5 minutes, again remove and whisk. Now add colour, extract, citrus peel, whisk until everything mixed so well. Again return the mixture to microwave and heat it for additional 3 minutes. Now mixture should be very thick and large portion of the mixture should stick to the balloon of the whisk, if not heat it for another 1-2 minutes. You can check consistency by letting small amount of mixture sit for a while in a plate or bowl, when it's cooled a little , you should be able to pick up and roll it into ball without getting sticky. Grease any plate or baking pan with cooking spray, pour the batter in it evenly. Let the mixture cool and set for three to four hours or longer. Once it's set perfectly. time to cut the Turkish Delight. Dust the cutting board with corn flour, remove and place the set mixture block onto cutting board. Cut the Turkish delight with sharp knife or scissor. Now mix remaining corn flour, powdered sugar and cinnamon powder. Dust squares in this mixture. 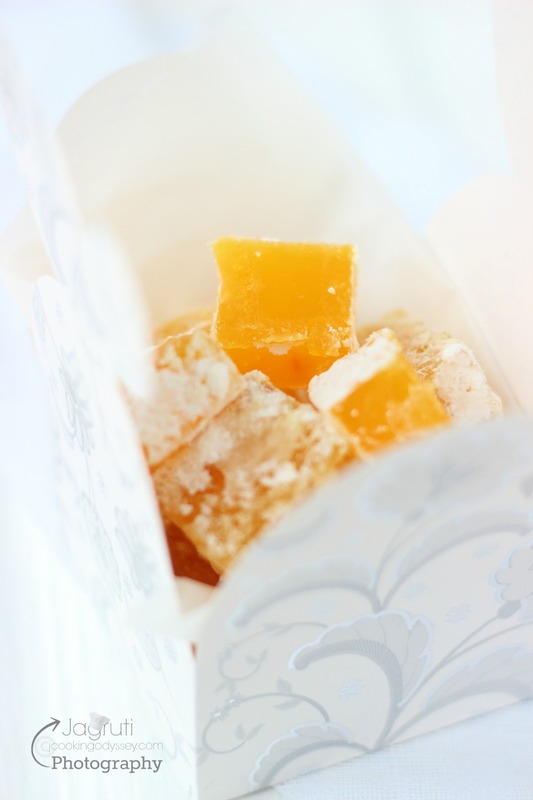 If you want to gift this Turkish Delight, Generously dust them with corn flour mixture and place them in a gift box. These look gorgeous and so inviting!! 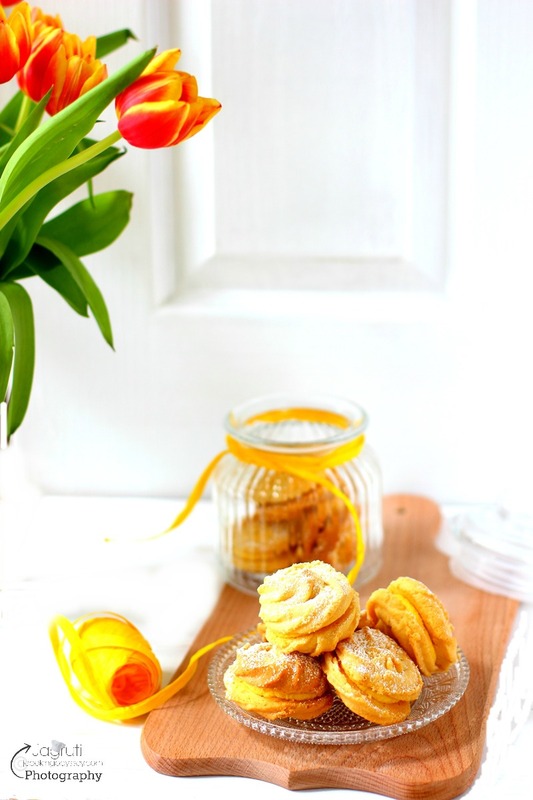 Love the combination of orange and cinnamon in them :) Have never tried one of these but looking at your beauties, I am so tempted to try soon!